Make a colorful statement today with our Neon Splash bouquet! Featuring bright lime green, orange, yellow and hot pink blooms, this exhilarating arrangement is the perfect way to lift someone's spirits. Say Thanks, Get Well, Thinking of You or Just Because with fresh flowers from Baskets & Bouquets Florist! 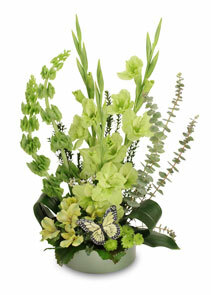 Welcome the warmer weather with a colorful spring flower arrangement from Baskets & Bouquets Florist. Inspired by the rich hues of the Emerald Isle, our Fresh like Springtime Arrangement features green roses, carnations, dianthus, hypericum and babies breath.